Mobile and tablet video viewing has seen huge growth in 2012, but it’s still a small piece of the overall cake: That’s one of the key takeaways from Ooyala’s 2012 Global Video Index report, which the video platform provider published late Monday. 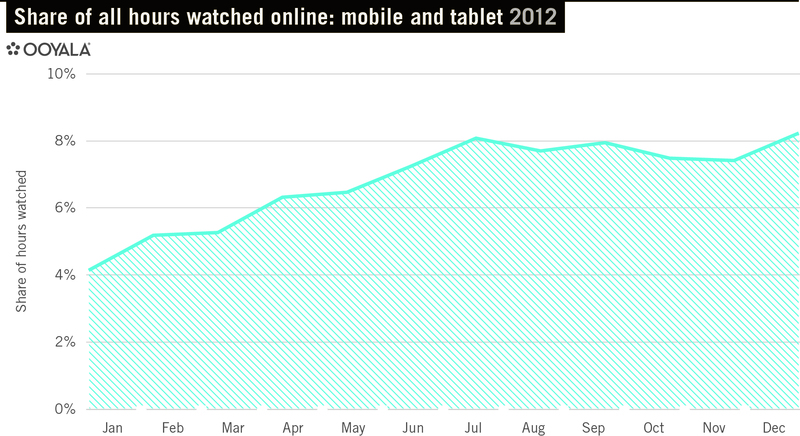 Based on hours viewed, tablets saw their usage grow 110 percent in 2012. Mobile phone video viewing grew 87 percent in that same time period. However, both device classes together still only accounted for 8.25 percent of all video viewing hours in December of 2012, compared to 4.15 percent at the beginning of the year. 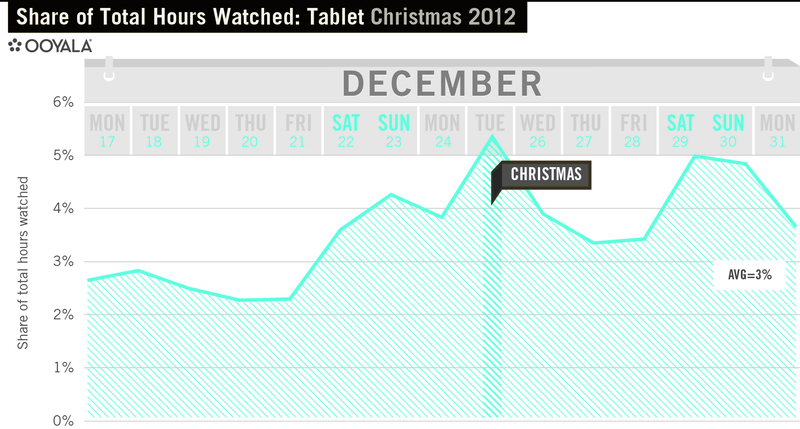 In comparison: Desktop viewing was still just shy of 90 percent in December. There are a few things worth pointing out: The data for the report comes from Ooyala’s 150 biggest clients. Ooyala’s client roster includes names like Rolling Stone, ESPN (s DIS) and Vice (and yes, also GigaOM, check the bottom of this post for a disclaimer), and it claims to reach 200 million monthly unique viewers. However, the company doesn’t have any relations with Netflix (s NFLX) or YouTube, (s GOOG) which are two of the biggest video traffic sources on the internet. That means that Ooyala’s data may be more reflective of the way we use video from big web publishers, as opposed to video services like Netflix. Still, even with that caveat, it’s interesting to see how mobile is growing, and when: Ooyala reported a temporary spike of 73 percent for tablets on Christmas day alone. Disclosure: GigaOM has a commercial relationship with Ooyala for the delivery of its video content. Waste of a read. My content channels see 22% and 36% mobile viewership, respectively, on Youtube. Your reporting sounds like an outdated terrestrial Nielsen report for TV. Are you against mobile? or a shareholder in Ooyala? This report is a joke. Does this include both wifi and cellular traffic? Excluding Netflix and YouTube, the headline is misleading.